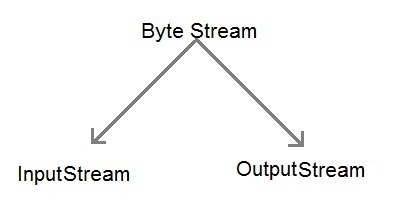 Byte stream is defined by using two abstract class at the top of hierarchy, they are InputStream and OutputStream. These two abstract classes have several concrete classes that handle various devices such as disk files, network connection etc. Some important Byte stream classes. BufferedInputStream Used for Buffered Input Stream. BufferedOutputStream Used for Buffered Output Stream. FileOutputStream Output stream that write to a file. InputStream Abstract class that describe stream input. OutputStream Abstract class that describe stream output. read() : reads byte of data. write() : Writes byte of data. 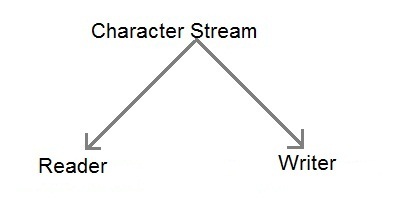 Character stream is also defined by using two abstract class at the top of hierarchy, they are Reader and Writer. These two abstract classes have several concrete classes that handle unicode character. Some important Charcter stream classes. BufferedReader Handles buffered input stream. BufferedWriter Handles buffered output stream. FileReader Input stream that reads from file. FileWriter Output stream that writes to file. OutputStreamReader Output stream that translate character to byte. PrintWriter Output Stream that contain print() and println() method. We use the object of BufferedReader class to take inputs from the keyboard. read() method is used with BufferedReader object to read characters. As this function returns integer type value has we need to use typecasting to convert it into char type. Below is a simple example explaining character input. To read string we have to use readLine() function with BufferedReader class's object.